Hey there! I'll try to be brief and catch everyone up on my last session from the Holiday season. When the new Christmas season comes around each year, I try to find nice locations for my Holiday sessions. I will usually go anywhere I am permitted to shoot for my family sessions but this year was extra special because I actually was able to do something very different! A client of mine had asked me to find a tree farm and I was like....that sounds cool but let me see if any of the businesses will be available. Some places would not call me back so I assumed they were not okay with a photographer walking around. I decided to drive to Haring Tree Farm one day in November and the owner was there working that day. He was fine with the idea of a photographer using the land as long as it was before customers started arriving for the tree season. I was so excited at the prospect of being able to use private land and not rely on shooting at a public park. In late November two clients met with me at the tree farm. I did my practice shoots a few times there with my kids as well. It was a good experience for me as an artist. I feel like I could maybe do it again next year if I get enough interest! 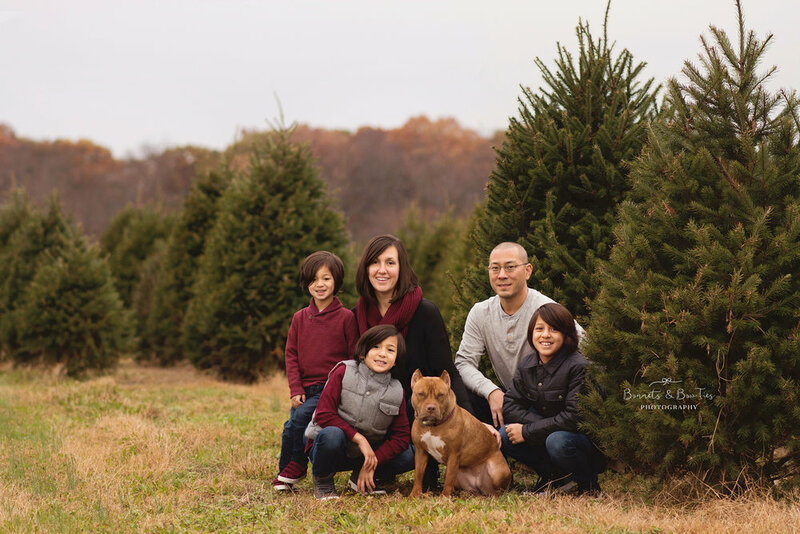 One of the families who met me at the tree farm was the Yun Family! We also met previously for a family session last year. I'm just going to post a few pictures from that session so you can see how big their boys got! Enjoy! If I am honest, it would be so hard to recreate this light again!! Seriously one of my favorite images from 2016!! Um, best family portrait EVER!! Those boys....I'm telling you they are such handsome guys! I always check to see if Dad wants a portrait and usually guys are okay with it! Lucy girl, so well behaved and sweet! I hope everyone liked the photos! I love my job! Jamie I am so glad that you wanted me to take your pictures again!! Thank you!! *Angela is a natural light photographer who specializes in babies, children and family photography in York and Lancaster PA.